An Scolopendra polymorpha in uska species han Chilopoda nga ginhulagway ni Charles Thorold Wood hadton 1861. 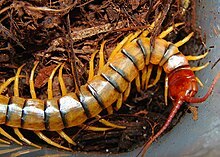 An Scolopendra polymorpha in nahilalakip ha genus nga Scolopendra, ngan familia nga Scolopendridae. Waray hini subspecies nga nakalista. ↑ 3.0 3.1 3.2 3.3 3.4 Shelley R.M. (2002) A synopsis of the North American centipedes of the order Scolopendromorpha (Chilopoda), Virginia Museum of Natural History Memoir. 5: viii+108 pp. ↑ 8.0 8.1 Kohlrausch E. (1878) Beiträge zur Kenntniss der Scolopendriden, Inaugural-Dissertation, Marburg. 27 pp. Ini nga pakli kataposan nga ginliwat dida han 20:19, 20 Hulyo 2013.